Review: This is a story following the Normandy Landings. A group of U.S. soldiers go behind enemy lines. They retrieve a soldier who parachutes down from airplanes whose three brothers have been killed in action. 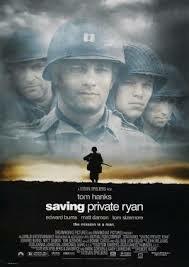 This is a well told story superbly directed by Steven Spielberg. I don’t think there could have been another director who could have done such a great job. These are the greatest war scenes that you will ever see in a film. Steven Spielberg communicates his ideas in feelings, not words. Tom Hanks’ character isn’t too overly done but yet they could have made much more of him. A very touching performance from Tom Hanks. Billy Bob Thornton and Christopher Eccleston were both offered roles but turned them down. Industrial Light and Magic (ILM) worked on a few special effects but was very much downplayed. At the Academy Awards in 1999 this won 5 Oscars. They were for Best Director, Best Cinematography, Best Sound, Best Film Editing and Best Effects, Sound Effects Editing. At the Golden Globes the same year it won 2 Awards and they were for Best Motion Picture – Drama and Best Director – Motion Picture. At the Bafta Awards also the same year it won for Best Sound and Best Special Effects. One film critic wrote about this film “The film is directed by Steven Spielberg, and breaks new ground in content and style. It merges some of the most realistically disturbing footage ever included in a feature film with a touching human story”.